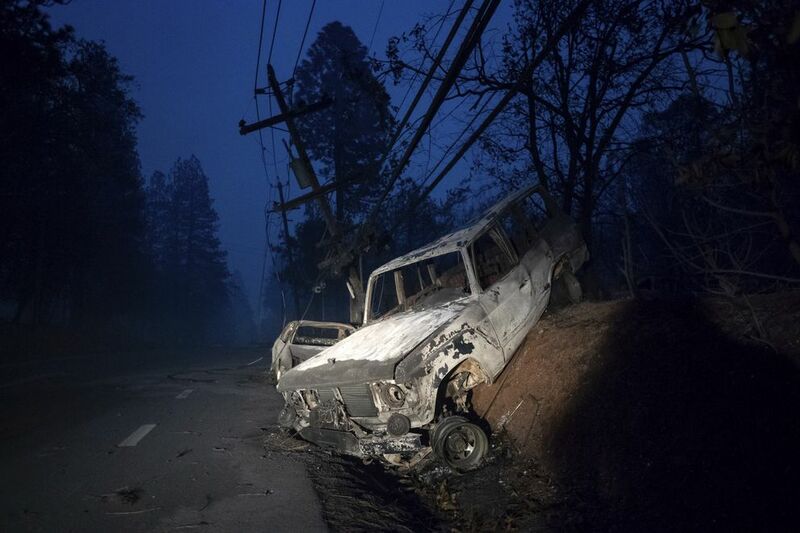 PARADISE, Calif. — A Northern California wildfire that moved so fast firefighters didn’t even try to stop it killed five people, authorities said Friday as the blaze quadrupled in size after leveling much of a town of nearly 30,000 people. Only a day after it began, the blaze near the town of Paradise had grown to nearly 110 square miles, and investigators found the dead in vehicles that were torched by the flames. "There was really no firefight involved," said Capt. Scott McLean of the California Department of Forestry and Fire Protection, explaining that crews gave up attacking the flames and instead helped people evacuate. "These firefighters were in the rescue mode all day yesterday." With fires burning in both Northern and Southern California, the director of the Governor's Office of Emergency Services put the number of people forced from their homes at 157,000. The winds calmed down in the valley, but they were still shifting and erratic, with speeds of up to 45 mph along ridge tops, he said. A nurse called Rita Miller at about 7 a.m. Thursday, telling her she had to get her disabled mother, who lives a few blocks away, and flee Paradise immediately. Miller jumped in her boyfriend's rickety pickup truck, which was low on gas and equipped with a bad transmission. She instantly found herself stuck in gridlock. "Most of them were immobile, with walkers or spouses that were bedridden, so we were trying to get additional units to come and try and help us, just taking as many as we could," he said. Associated Press writers Jocelyn Gecker, Janie Har, Daisy Nguyen, Olga R. Rodriguez, Sudhin Thanawala and Juliet Williams in San Francisco, Sophia Bollag in Sacramento, Michelle A. Monroe in Phoenix and Jennifer Sinco Kelleher in Honolulu contributed to this report.